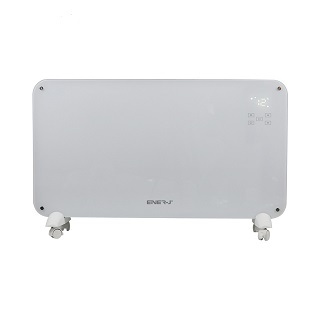 This silent and economic 2Kw smart Wifi Controlled tempered glass panel heater is suitable for use as either a fixed wall heater or as a portable heater. Indeed it comes with both standing feet and a wall mounting bracket. Compatible with Amazon Alexa or Google Home, users can control this heater through voice command for the purposes of turning the unit on or off and for even setting the desired temperature to ensure any room is kept cosy and warm throughout the winter whilst not wasting energy and adding to bills unnecessarily. 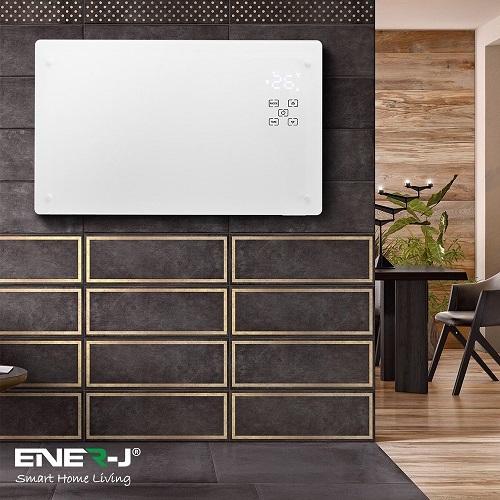 This smart heater from Ener-j is modern, stylish and comptemporary with a slimline, flat panel design (glass fronted) with rounded edges. The heater has an in built power indicator light and thermostatic cut off feature as well as a digital control feature which allows you to set day and weekly timer for when heater is to operate and also comes with a remote control. The smart heater has a specially-treated aluminium alloy electric element provides rapid room heating and is ideal for allergy or asthma suffers as it does not burn oxygen or dust and has no moving fan which can blow out particles.